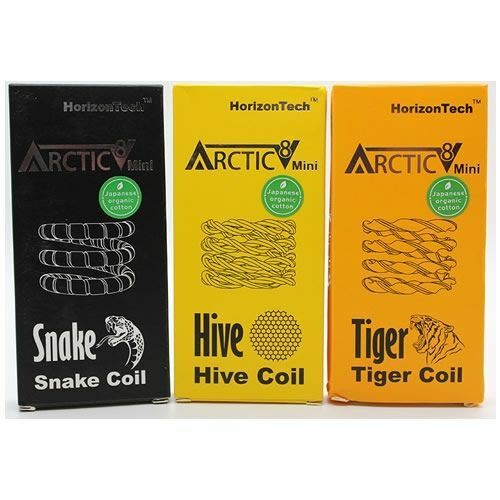 The Horizon Arctic V8 Atomizer Coils are genuine Horizon brand atomizers that are compatible with both the Horizon Arctic V8 and Arctic V8 Mini Sub ohm Tanks. These atomizers are designed for high wattage vaping, ranging anywhere from the Snake coil that can be used up to 70W to the HIve coils that can support an astounding 120W of power. The monster coil series are wicked with an organic Japanese cotton for an unmatched quality of flavor and have a Kanthal heating element that is exclusively for use with variable wattage devices and will not work in temperature control output modes.